Family of Kazakh nomads. Photographed in 1911 moving across the Golodnaia steppe in present-day Uzbekistan and Kazakhstan. Photo by Sergei Mikhailovich Prokudin-Gorskii. Digital colour rendering. Library of Congress website. The various uses of grain were spread along Eurasia through nomadic shepherds, as they evidenly had access in different grain species, archaeologists suggest, as domesticated crops from opposite sides of the continent were found mingled together by digging the remains of several herders’ campsites in Kazakhstan. “Ancient wheat and broomcorn millet, recovered in nomadic campsites in Kazakhstan, show that prehistoric herders in Central Eurasia had incorporated both regional crops into their economy and rituals nearly 5,000 years ago,”, states archaeologist Micheal Frachetti who participated in a research project by archaeologists from the US, Italy and Kazakhstan, whose results were recently published in the Proceedings of the Royal Society B. In detail, researchers working in the remains of a certain Kazakhstani campsite dating from 3,000 BC found seeds from two different grain species. The first species, a bread wheat known as Triticum aestivum, had been evidently domesticated in the Middle East since 4,000 BC but did not reach East Asia before 2,500 BC. On the contrary, the second species found, domesticated broomcorn millet (Panicum miliaceum), probably originating from and domesticated in China 8,000 years ago, has not been found in Middle or Near Eastern contexts dating from earlier than 2,000 BC. It appears that during a chronological period set between two milestones in grain domestication, people living in a site in Central Asia were using two species of grain that was made available in Eurasia’s two sides later. This observation allowed scientists claim that these populations could well be involved in transferring grain across Asia. 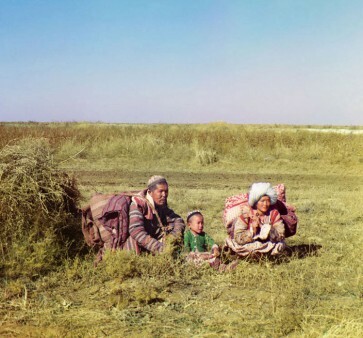 In addition, the researchers found evidence that herders began farming millet, wheat, barley and legumes by 2,000 BC, pushing back the earliest know farming in the Turkmenistan/Kazakhstan area by 2,000 years.